Transactional Analysis in Sales - Manipulative or Necessary? I read David Sandler’s book “ You Can't Teach a Kid to ride a Bike at a Seminar” in 2002 and was intrigued with some of his ideas. David Sandler, to my knowledge was the first sales trainer to recognize the value and popularize the use of Transactional Analysis techniques (TA) in sales. Sandler started out selling sales training programs on 78 records. He made thousands of calls and observed that it had become an accepted belief in Western culture, that sales-people are fair-game. Furthermore, he observed that many buyers believe that it’s OK to waste a salesperson's time and resources, deliberately mislead them and even lie or with-hold the truth from them. Sandler believed the use of TA and other manipulative techniques were the only way salespeople could level the playing-field in a relationship that was heavily tilted in favor of the buyer. Sandler died in 1995, but his "negative reverse selling", and "struggling child" are pure Transactional Analysis techniques applied to selling situations and live on through generations of Sandler training professionals. The following is a brief introduction of the ego-state model and a Flash video of a scenario for using a complementary transaction. Adult: a state in which people behave, feel, and think in response to what is going on in the "here-and-now," using all of their resources as an adult human being with many years of life experience to guide them. Parent: a state in which people behave, feel, and think in response to an unconscious mimicking of how their parents (or other parental figures) acted, or how they interpreted their parent's actions. Child: a state in which people revert to behaving, feeling and thinking similarly to how they did in childhood. We experience constant movement between all the ego states in response to thoughts, events, people, and memories. 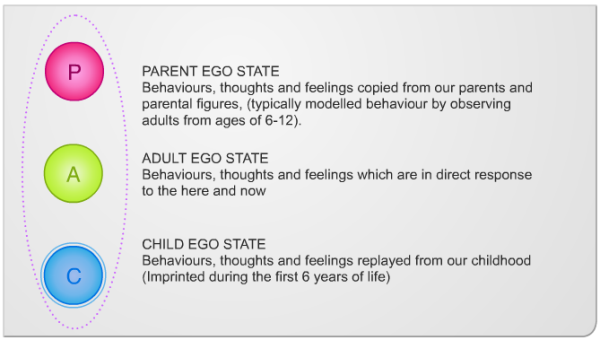 Transactional Analysis - Complementary Child-Parent Transaction "The Struggling Child"